AI-enabled module adds next-generation performance and power efficiency for edge processing for autonomous machines. NVIDIA today announced general availability of production modules for its Jetson AGX Xavier platform, aimed specifically at robotics developers building the next generation of autonomous machines. The modules, which cost $1,099 in quantities of 1,000 or more, are now available from distributors worldwide, including Arrow Electronics, NVIDIA said. In September, the company announced the Jetson AGX family at its GTC Japan Event. Today’s announcement was made at a developer’s event in Santa Clara, where more than 400 developers met to learn more about the platform. The system includes a small computer module capable of up to 32 trillion operations per second (TOPS), with multiple operating modes (10W, 15W, and 30W). In addition, the AGX Xavier platform is more energy efficient than its predecessors, including the Jetson TX1 and TX2. The company also announced the newly available TX2 4GB model, with a lower-cost model than the 8GB version. In addition to the module, NVIDIA provides support and tools for developers, including the Jetpack and DeepStream software development kits. The SDK for autonomous machines includes support for AI, computer vision, and multimedia, among other features. Applications that could benefit from this edge technology include package delivery and industrial inspection systems, which would require advanced levels of real-time perception and inferencing to perform, NVIDIA said. 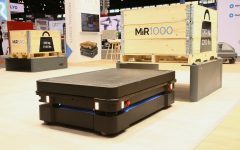 The high-performance system “can handle visual odometry, sensor fusion, localization and mapping, obstacle detection, and path-planning algorithms critical to next-generation robots,” the company added. Since making the developer’s version available in September, several companies have begun work on building systems with the new platform, NVIDIA said. Oxford Nanopore, a U.K. medical startup, said it is using Jetson AGX Xavier for its MinIT handheld AI supercomputer to perform real-time analysis with its MinION handheld DNA sequencer. “MinIT can be nearly 10 times more powerful than standard laptops and brings portable, real-time sequencing to more people in more locations,” said Gordon Sanghera, CEO of Oxford Nanopore. In the robotics space, Japan’s Denso is also using the platform to achieve more efficiency in the global auto parts maker’s operations. Additional companies that announced working with Jetson AGX Xavier include Yamaha, Komatsu, JD.com, Meituan, FANUC, Kawada, and Musashi Engineering.